I love it when Megan makes pavlovas for a party (last weekend it was both Grace’s birthday and Australia Day!). Pavlova bases are made from meringue, which is basically whipped egg-whites and sugar. Each pavlova leaves 4 egg yolks unused. With a total of 4 pavlovas made over the weekend, I had 16 yolks! The reason I get excited over leftover yolks is because they make the best pasta. Normally I make pasta with the whole egg, but when you can make it with just yolks it’s much richer and creamier. My normal pasta recipe is dead simple – 1 egg and 100g ’00’ flour per person. 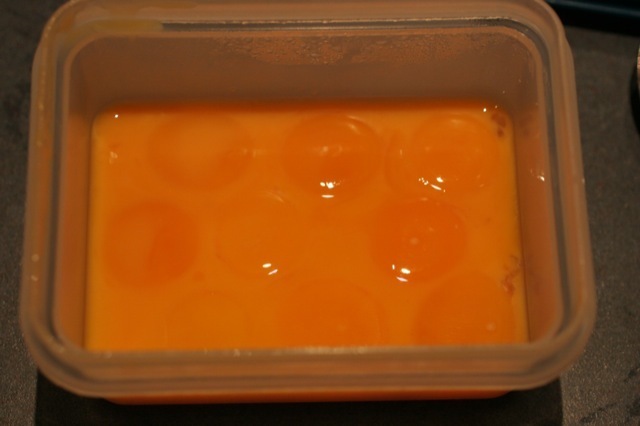 If using yolks only, use 3 yolks to 100g flour. You can get ’00’ flour at nearly any supermarket – it’s a finer flour, ideally suited to pasta-making. Normal flour works OK if you can’t get ’00’. Mix in a bowl until it comes together, then knead on the kitchen bench. 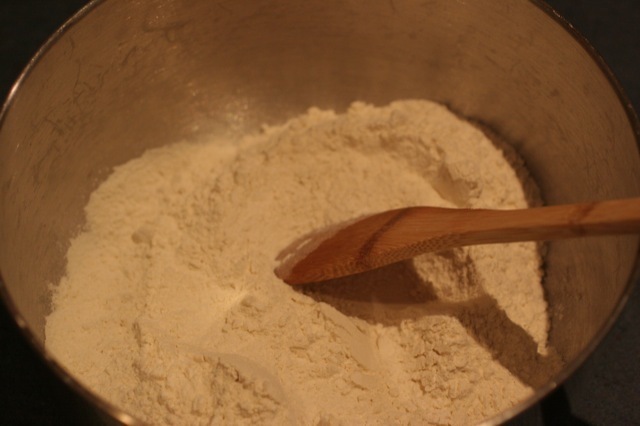 Sprinkle flour on the bench to stop the dough sticking during kneading. Then it goes through the pasta machine. 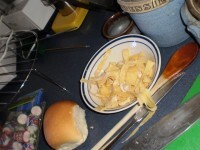 I have a really simple hand-cranked pasta maker. You set it to ‘0’, the thickest setting, and run an egg-sized ball of pasta dough through it. Then fold it over and put it through again. Repeat this 4 or 5 times (this makes sure the pasta nice and consistent texture). Now set the pasta machine to ‘1’, and run the dough through. Progressively wind up the thickness settings, so the dough gets thinner and longer with each pass through. You may need to lightly flour it at about ‘3’ or ‘4’ to make it easier to handle. I stop at ‘7’, which is a nice thickness. 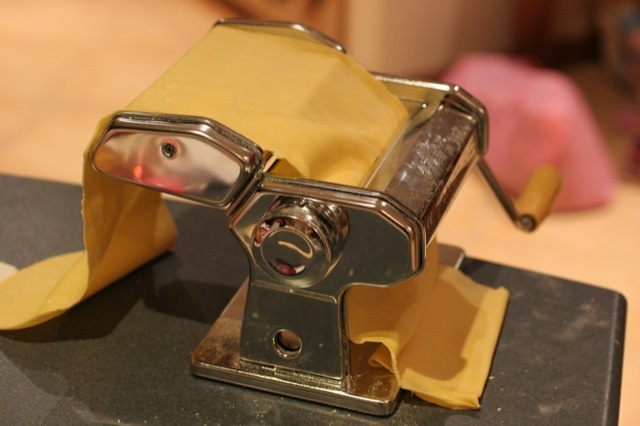 You can either leave it as a flat sheet for lasagne, or run it through the cutter mechanism on the back of the pasta machine to make fettucine. If you’re going to eat it straight away, simply drop the pasta into a big pot of salted boiling water. Let it return to the boil, and as soon as it starts to froth a little (after only about a minute), remove and drain. Serve and top with sauce. Alternatively, dust the cut fettucine with flour to prevent it sticking, cover it to stop it drying out, and it’ll keep in the fridge for a couple of days. Or you can hang it in a cool airy place to dry, and then keep it in jars for a week or two. When I make a large batch of pasta, I leave it as flat sheets. You can stack it without sticking if you sprinkle a generous dusting of flour between each layer. 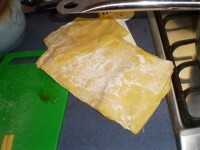 Divide into meal-sized batches, wrap with cling film, and freeze. It should keep in the freezer for at least a month. You can either use the frozen sheets in a lasagne, or thaw and cut them into strips to make fettucine or other styles of pasta. If you want to get really fancy, you could cut it into squares, put a dab of ricotta and spinach mixture in the middle, and fold it to make ravioli. Yum. I am impressed you make your own pasta. I am wheat intolerant so I do make my own too (but it doesn’t look as good as yours). What do you use instead of wheat flour, Sarhn? Rice flour? Something else? Is your recipe otherwise similar to mine? Great work your pasta looks fab. Did u get my email re the dapto community gardens. When I first realise I had an issue with wheat and gluten was over 20 years ago. Back then I made flour with a combination of rice, corn and something else (need to check my notes). Today however it is easy as you can by flour that is gluten free from everywhere (even Coles & Woolworths). Every meal I cook for the family is gluten free and no one can tell the difference (it is easier than cooking two meals). I actually don’t think wheat is a very good grain – there are much healthier alternatives. I had a friend at school that had a gluten issue. All I really remember is that he had to have special breads etc. I still don’t really know much more about it than that, although looking into making things yourself and using alternative grains always turns up gluten and other intolerances as a motivation for many people. How fabulous! It is something I’d really like to do at some point! It’s a little bit of messing around, but it’s pretty easy and very rewarding. Plus it tastes great :-).